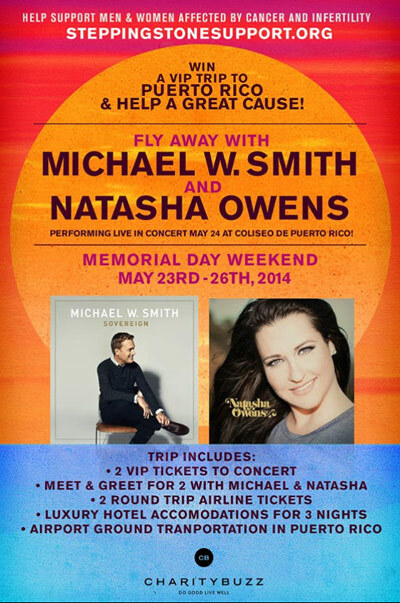 Dallas, TX – Michael W. Smith and Natasha Owens will spend Memorial Day weekend in Puerto Rico and you can join them! A very special VIP Auction, sponsored by Gatorwire, has been announced which will benefit the work of Stepping Stone Support. Reneé Lynn Scott founded the Stepping Stone organization in 2005 after her own battle with cancer. Individuals interested in placing an bid for the VIP trip auction can do so by visiting www.NatashaOwensMusic.com and clicking on the poster. Through a special partnership with Gatorwire, Natasha Owens is donating this trip and all proceeds from the auction will go directly to Stepping Stone. To place a bid, visit www.NatashaOwensMusic.com. For more information on the work of Stepping Stone, visit www.steppingstonesupport.org. Michael W. Smith is an acclaimed singer, songwriter, and musician who has sold more than 15 million albums, achieved 28 No. 1 songs, earned three GRAMMY® Awards, one American Music Award, and more than 40 Dove Awards. Throughout his career, the Contemporary Christian Music artist has had the opportunity to sing for several Presidents and national leaders. He actively supports the teen club Rocketown, Compassion International, and Samaritan’s Purse, the ministry headed by Franklin Graham. Michael and his wife Debbie live in Middle Tennessee, where they raised their five children. His first studio worship album since 2008, Sovereign, will be available in stores on May 13, 2014. For more information, visit www.michaelwsmith.com. Posted on April 25, 2014 at 4:15 pm in Michael W. Smith	| RSS feed You can	trackback	from your own site.